When snow and ice season begins, there can be serious problems for your restaurant or facility if you’re not prepared. However, by having a strategy ready which everyone at your workplace understands, you will be much better able to handle whatever Mother Nature throws at you, even if that amounts to severe storms. By properly identifying the various threat levels associated with winter weather, everyone at your facility will understand what is expected of them when bad weather hits. Below are described five different threat levels of snow and ice accumulation, along with the responsibilities required of both facility managers and service providers. At this level, there is no snow or ice forecast for the coming 24-hour period. Since there are no physical activities necessary at this threat level, it’s a good time to check on preparedness. Facility managers can evaluate readiness, and can also assess the response of service providers during recent threat levels. Service providers themselves can use the time to restock and reorganize all necessary resources, in anticipation of coming threats. At this level, it is expected that there will be no more than light ice accumulation, and less than an inch of snowfall. During this threat level, service providers should be preparing strategies for preventive maintenance, for instance applying salt to nearby surfaces, so that ice doesn’t begin to form and cause slipping problems. Facility managers should focus their attention on those restaurants or other facilities which have the most amount of customer traffic. Visiting individual stores or restaurants is a good idea to stay apprised of their status, and the weather forecast should be frequently consulted in anticipation of worsening conditions. During an elevated level, there could be ice and snow accumulation for the next 12 to 36 hours, but at a rate which is manageable. Snowfall is expected to accumulate no more than 6 inches at this level. Service providers should be visiting facilities to accomplish shoveling, plowing, and de-icing activities for parking lots and sidewalks. Facility managers should maintain good communications with all facilities and stay abreast of the status of each location, as well as staying in contact with service providers so as to be aware of their progress. If one facility or another is receiving heavier snow and ice, this needs to be pointed out to service providers. Seven or more inches of snow will be expected to fall during a 12-hour period when a high threat level is in effect, or if the weather is more persistent, more than 9 inches will fall during a 24-hour period. 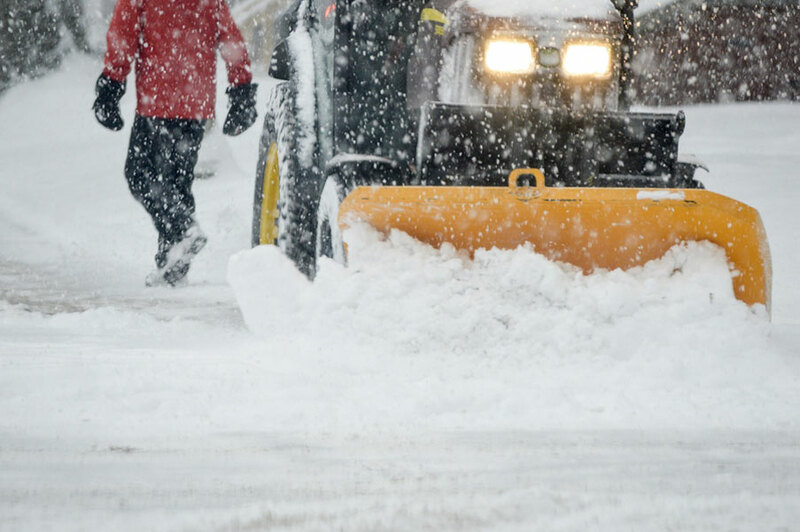 Facility managers should make sure that enough service providers are available to cover plowing and de-icing activities at all facilities during heavy snowfall. If driving conditions make it difficult for service providers to reach certain locations, backup service providers will need to be directed to those facilities. The service providers themselves should perform repeated plowing and salting services in order to keep up with the continuing accumulation of snowfall. It may be necessary to bring in extra equipment for hauling snow away. When there is a severe threat level in effect, blizzard-like conditions are often present, with two or more inches of snow falling within an hour. Road closings may also occur during this threat level. Facility managers should be prepared to close certain restaurants or facilities, so that risks to employees and customers can be avoided. If it is necessary to keep certain facilities open and operating, additional service providers may need to be contacted to accomplish the snow and ice removal. Service providers will have to do their best to keep up with the rapid rate of snowfall, removing snow and de-icing parking lots and sidewalks to the best of their ability. If necessary, front loaders and large dump trucks should be brought in to accomplish snow removal, so the facilities can be kept safe and operational. If you need assistance with winter weather readiness, ABS Facility Maintenance can help. Our pre-screened technicians are ready to assist you today. ABSFM offers a wide range of services to the Restaurant and Facilities Industry. Contact us today and let ABSFM be THE source for all your facility maintenance and repair needs.